Soane proposed a variety of designs for Kelshall Rectory. This preliminary design was made two weeks after Soane first visited the property and was not chosen by the client. The executed design was more substantial, spanning the long side of the house and covering two floors. Soane first visited Kelshall Rectory on 5 August 1788. On 20 August, he sent to Mr Waddington four alternative designs for an addition. This drawing is a copy of design 'No 3', proposing a timber addition with two bedrooms and a staircase. Estimates were made but none of the designs were approved. 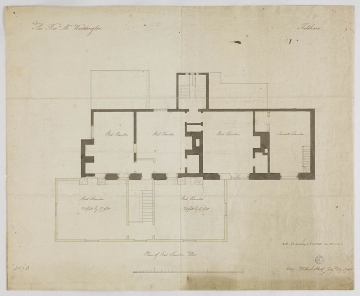 Soane subsequently made designs for a new house, sending proposals to Mr Waddington on 14 September. In November and December, he made further designs for an addition and sent them to the client. The building was completed by July 1789, when Soane was paid his commission of £20. Assuming Soane charged his usual rate of 5%, the building works must have cost £400. The house still exists today and is relatively unchanged (P. Dean). For the verso of this drawing, see Gunthorpe Hall, Norfolk: designs for a new house for the Revd Charles Collyer, 1789-90 (10), drawing 1 (q.v.). Soane's Journal No 1 records that John Sanders (pupil 1784-90), Robert Woodgate (clerk 1788-94) and John McDonnnell (1786-91) made drawings for Kelshall in August 1788. P. Dean, Sir John Soane and the Country Estate, 1999, p. 177.